The Indian Military Academy is a renowned world class training institute, the training here is multifarious, the Gentlemen Cadets (GCs) get the finishing touch to sharpen their leadership traits to make them effective junior leaders, which on joining their units post commissioning enables them to effectively take on the rigours and challenges of soldiering from Day One. As they go through the routine of demanding physical and intellectual training, psychologically they imbibe intangible traits of loyalty to the Flag, Honour, Izzat, Camaraderie, a never say die spirit, the importance of high morale and a host of other such sublime qualities; both these traits, the tangible and intangible are inter-dependent and of great importance to develop a wholesome personality. The training years also build life long, undying friendships with not only their course mates, but with a wide net to include their seniors and juniors under training at the Academy and particularly their own Company, thus metamorphosing the company into a team, with a spirit to win, but never at the cost of one-upmanship. They carry these qualities with them, which act as a catalyst to inspire them to reach unheard heights of valour, glory, comradeship, a will to never besmirch the name of the outstanding organisation which is going to be a part of them, the Indian Army. I possibly have had the singular privilege and honour to have served seven years at the IMA, as a Captain, Major, Colonel and finally as the Commandant and witnessed many incidents where I observed these intangible or sublime qualities, of loyalty, camaraderie and never die spirit etc visibly being displayed by the cadets and the company as a team. Out of the plethora of my experiences, two examples would suffice to convey all that I have said in the preamble. As a part of the tactical military training the final term cadets are put through the rigours of mountain warfare in the rugged mountains around Mussourie (but well away from the places that tourists enjoy), the aim is to give them a little feel of the mountains, of how to read the battle, physical strain in negotiating steep gradients, difficulty in preparing defence works, coupled with inclement weather (if nature helps) and finally, to learn that despite the difficulties it is possible to be perseverant and have the will power to conduct battle resiliently. During one such exercise, I flew in to visit the young lads, the weather turned foul, rain and thunder seemed to say this is the day, but was ideal for the training planned, but suddenly an intense crackle of thunder and lightning, reminiscent of an artillery barrage ran through the sky and led to an emergent situation. The radio set crackled, the message was disturbing, lightning had struck a group of GCs, five lay unconscious, immediate evacuation was a must. Before I could say anything I observed the oozing exuberance of the helicopter pilots to take on the task. Oblivious of the weather which restricted flying and the risk involved, the pilots unhesitatingly took on the dangerous mission. They proved their expertise, landed and evacuated the most serious GC to the military hospital, but sadly we lost this brave son of India. The others in the meanwhile being less affected had found their bearings and were up and about. The exercise was in the final stages, the last event being the scheduled physically challenging run back to the Academy early next morning, a much-awaited event, which each company vies to win and outdo the other, however the company affected by the lightning strike were in a dilemma. The loss of a comrade weighed on their mind, besides the other four GCs affected by the lightning included the Company Senior Under Officer and the Company Sergeant Major, two important cadet appointments who act as rudders of leadership in such events were not permitted to participate in the run back due to medical advice. The company had to take on the challenge sans them. The company had vowed to give a special salute to their departed mate, nothing could stall them or affect their morale, the run was very special to them and took it on as if it was the final event of a lifetime; as a collective team they cheered and pushed each other, their inner strength had taken over as they paced the way back, they finally finished the run most creditably but were just five seconds behind the eventual winners. They were runners up, but what a salute and honour they gave to their departed comrade. Their camaraderie and will to win was just superlative, the missing leadership also brought forth the hidden talent. Today as I write about this a decade later, it still charges me up, it is hair raising, I salute the gallant pilots and that lot of gentlemen cadets. Another memorable experience was during the annual cross-country run, in which each training company as a collective whole and individuals race each other for the top honours, the lead runners push their reserves to break the existing record and get endorsed for the prestigious Blue in Cross Country running (a life time privilege which can be displayed on their Academy Sports Blazer), the atmosphere is charged and the competition intense but despite this, human emotions still win. The race starts in a kaleidoscope of company colours, 1500 or more pairs of feet thunder down the open space, the guides astride horses’ gallop away lest there is a stampede. Like any competitive race the runners break up into smaller groups, the front pack of runners, the crème de crème, gradually break away and stream well ahead. Closer to the finish the race runs through the shrubs of the Tons Valley, the two lead runners had outpaced everyone and were pelting away, when suddenly a wild boar evidently disturbed by the clatter of horse hoofs suddenly hurtled out and struck the shin of the lead runner, who, taken by surprise, lay spread eagled on the ground; the runner following him did not see in this an opportunity to win the race but stopped and assisted his fallen comrade, least concerned of what he may lose out on, the Cadet hurt stood up, declared that he was ok and egged on the Samaritan to carry on with the race. Both completed the race in good time, the injured cadet despite bleeding pulled his reserves of energy and will power to complete the race, both may have lost out on getting endorsed for the blue, but the display of their camaraderie, personal sacrifice by one and will to ensure mission accomplishment by the other earned them respect of hundreds of fellow cadets and instructional staff at the Academy with a special prize from the Commandant accompanied by a thundering applause. The training finally comes to an end, on their Passing Out Parade, the Gentlemen Cadets step across the “ANTIM PAG” (last step) across a Rubicon and march out as officers of the great Indian Army, who vouch to do their Nation proud and have repeatedly shown their valour under live fire, their sacrifices have been tremendous, the Academy War Memorial is a standing testimony to this. While credit for this goes to the holistic training at the Academy, but this would not have been possible without the dedication of the Instructional Staff; the NCOs, JCOs who sharpen their skills at drill, weapon handling to ensure ‘EK GOLI EK DUSHMAN’, physical fitness, horse riding; the platoon, company and battalion commanders who, are at and with them in developing their personality and intellectual growth and of course the Administrative Staff who care for their needs, house and feed them well to take on the rigours of training. The instructors abide by the code laid for them. 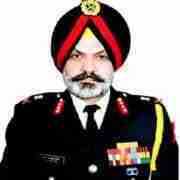 An alumnus of Punjab Public School, Nabha, National Defence Academy, Khadakwasla and Indian Military Academy, Dehradun, Lieutenant General RS Sujlana was commissioned in June 1971 into 9th Battalion, The Sikh Regiment as a third generation Army Officer. Baptized in battle during the 1971 Indo-Pak War in Jammu and Kashmir, he had five tenures of battling insurgency and terrorism. Commanded 3 Sikh, the same Battalion his father, Colonel Gulcharan Singh commanded during the 1965 Indo-Pak War and later commanded 77 Mountain Brigade (Chindits) both in active counter insurgency/ terrorist operations in J&K and Assam, 24 RAPID and 10 Corps. Apart from prestigious staff appointments, including official spokesperson at Army Head Quarters as a Brigadier and Major General, he served thrice at the Indian Military Academy, as an instructor, staff officer and as the Commandant from October 2008 to June 2011. He was the Colonel of the Sikh Regiment for almost five years. Post retirement, he served as the Chairman, Punjab Public Service Commission and now spends his time writing for newspapers, studying Sikh History, enjoying philately, bird watching and playing golf. He can be contacted at sujlanaraj51@gmail.com.